The above quote is one of the more on-the-nose pieces of writing Mad Men has ever given us, even in a season as thematically overt as this one has been. Under any other circumstance, I would call it an unnecessary eye-roller, but in context, coming at the end of an extraordinarily tumultuous hour, they are the words Don Draper – and by extension, the audience – needed to hear. Even before Lane Pryce’s suicide, Don was dealing with some very tough emotional issues (which he channeled into the sad, desperate meeting with Ed Baxter); Lane’s death only added to Don’s confusion, and the presence of Glen – a child, whose outlook on the world is infinitely purer and less cluttered that an adult’s like Don’s – helped him begin to wade through this tangled web of feelings. Glen boils it all down for Don: why Lane killed himself, why Don pitched to Baxter even after landing Jaguar, even why Peggy would leave him, etc. It all happened for the same reason. It happened because we are, perhaps by our very nature, discontent, with our successes and our failures. Glen – and, of course, Sally – see adulthood as a glamorous ideal, the salvation from one’s unhappy lives, but as they approach it, all they feel is bitter disappointment. As a grown-up, Don is accustomed to the idea of adulthood being a series of setbacks and frustrations; so much so, in fact, that he can’t understand the logic behind Lane’s deadly unhappiness, or, indeed, his own. Glen, however, can articulate this morbid reasoning because he’s only taken the first steps on his adult journey, and when he explains his thoughts to Don, it all comes into focus: We either learn to live with the impediments we encounter and move on, or we succumb to our pain and hang ourselves in the office, ensuring all who care about us will feel that disappointment to their very core. 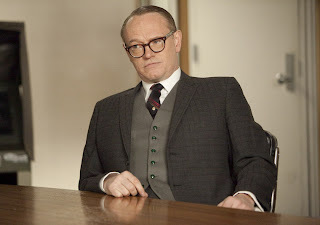 Lane Pryce was, at least on the Mad Men relativity scale, a good and decent man, one who did not deserve his tragic end. He made mistakes – in these last few episodes, colossal ones – but they came not from malice, nor even from purely selfish insensitivity (a la Pete). He instead was a man confused with the world in which he lived, lost in a storm of ambition and inequity he felt increasingly ill-equipped to navigate. He was an outsider, a man who not only came to the agency from another country with a different set of values, but a character who entered the show two seasons after everyone else and felt proportionally detached from that point forward. Try as he might, Lane never felt a part of the world he inhabited, and the more he tried to integrate himself with his new surroundings, the worse things got. His recent financial calamity was not the core reason for his suicide, but a symptom of a far larger disease. 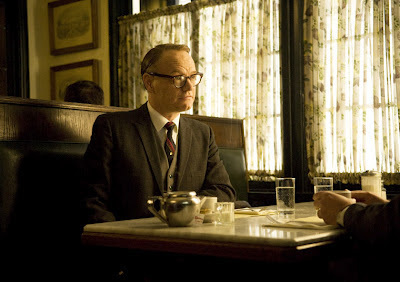 Lane desperately, pleadingly tries explaining this when Don demands his resignation; it may be Jared Harris’ single greatest, most stirring moment on his time with Mad Men, for it’s the only time Lane got to be completely vulnerable and honest with another human being. He’s scrambling, begging Don to understand how much the life he’s built here means to him, and how hard he’s always had to work to protect it. “Do you know how the rest of us live?” Lane asks. Again, I believe it’s about so much more than money. Lane doesn’t see Don as a self-made man the way we often do, but as a component of an institution, an institution that seemingly perpetuates itself without difficulty. Lane was there to see Don’s first marriage implode, to watch the original Sterling Cooper detonate, to see SCDP brought to its knees by Lucky Strike, and in all cases, Lane was also there to see how the pieces weren’t just picked up, but re-forged into something stronger. This is the life Lane wants: A life where second chances are possible and failures never lead to the worst-case scenario. A life of luxury, where he can make mistakes and still provide for his family, still make himself and those important to him happy. This is the life he has observed in those around him, it’s the life he’s chased with increasing desperation ever since coming to America, and it’s the life he would make a series of increasingly calamitous decisions for. Whether it was simple pride or something deeper that drove Lane to keep his problems a secret from the world, he did so because he believed he was playing by the rules of those around him. 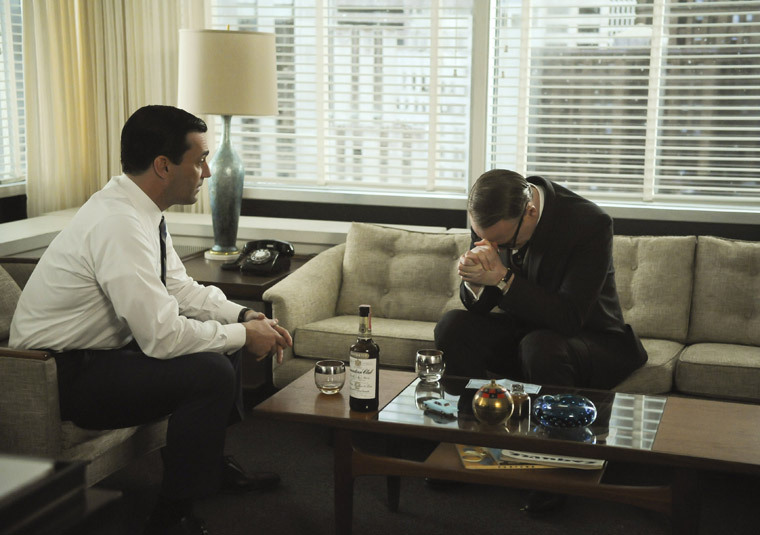 What drives him to tears in Don’s office, and to the noose in his own, is the realization that the rules are indeed different for him; he is not Don Draper, or Roger Sterling, or even Joan Harris or Peggy Olsen. He is Lane Pryce, and his failures will not go on to embolden him, but to send him and his family back to England, back where he started, far away from the apex of life’s ambition in America. He cannot have what he feels the others do and what he wants, so he chooses to stop trying. Forever. Many, perhaps even most of Lane’s conclusions are inaccurate. But that’s what ambition is, isn’t it? We, as the audience, know that his colleagues suffer for their sins the same way Lane does, and that the ideal Lane chases is probably unattainable. Happiness, as Don says to Baxter, is merely a moment before we start searching for more. But Lane is a genuine outsider, one who internalizes a large degree of emotional pain, and so he sees the world around him not as it is, but as it could and should be: As an escape, as a path to better days. When that path is closed off – definitively in Lane’s viewpoint – what reason is there to go on walking? Ironically, it’s the moment Lane fails to asphyxiate himself in the Jaguar that solidifies his suicidal resolve. When the car won’t start (making good on weeks of foreshadowing about the Jaguar being unreliable), it confirms all the feelings I outlined above: That no matter how hard Lane tries, he cannot get what he wants, even if his desire is as simple as a painless, dignified death. Even though Don isn’t anywhere close to Lane’s level of dysfunction, he too is feeling similar dissatisfaction in life, and throughout the episode, the two characters are presented as inverses. Where Lane finally succumbs to sinking as low as he can after losing everything, Don attempts to rise even higher after attaining so much. Case in point: while Lane prepares his resignation (and suicide) letter on Saturday morning, Don works on a pitch for a Lucky-Strike-sized account, and both turn their wives away in the heat of their work. Don should be content with Jaguar for the moment; as evidenced by the tire account that contacts Pete, other business will come to SCDP now that they have a car, and patience is probably the most logical path forward. 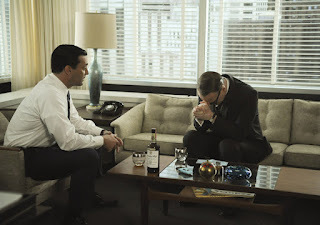 But Mad Men, especially this season, is just as much about the dissatisfaction we feel with what we do have as it is about the things we lack, and so Don convinces Roger to get him a meeting with Ed Baxter. It’s a stupid idea. A desperate idea. Even Don recognizes this, but he can’t help himself. Even though he has so much, he wants more. I’ve talked at length in recent reviews about why Don has become unhappy, but suffice it to say, his actions here solidify my argument. Ambition is unhappiness manifest, and Don, at the moment, is full of it. The pitch to Baxter could be seen as one of Don’s ‘brilliant’ creative moments, but I believe this is an improper reading of the scene. For one, Don hasn’t given one of his unqualified genius pitches for two full seasons now, and for the last two weeks, his attempts at reigniting that spark resulted in speeches that were more unsettling than inspiring. His conversation with Baxter is no different; rather than tell this man what he needs to hear to move $20 million in billings to a new agency, Don begins working through his own psychological issues, projecting them, erroneously, onto Baxter and his company. “You don’t want most of it. You want all of it,” Don says. That’s true, but not for Baxter. It’s true for Don. He’s a man who has had, in multiple phases of his life, almost everything a human being could ask for. Family, friends, love, wealth, etc. He has most of it. But he doesn’t have all of it, and that’s the only thing that drove Don to visit Baxter. It has nothing to do with SCDP or Baxter’s needs, and everything to do with Don’s own perennial discontent. I spoke of Don and Lane being inverses; Don’s conversation with Baxter, however, is not the ‘flip-side’ of Lane’s tearful confession. It’s the exact same scene, played in different rooms with different tones, but identical nonetheless. Don is pleading, to himself and his peers, to make sense of his own emotions and surroundings, just as Lane did to him. That’s not Don at his creative best, but Don at his most startlingly vulnerable. It’s the ‘Wheel’ pitch from season one without a positive takeaway. Lane’s suicide is a shock to Don’s core not only because he feels responsible, but because the stark reality of Lane’s mental state forces Don to reconsider the events of the episode. He must read his final conversation with Lane in a different light – even if Don didn’t necessarily do anything wrong in his handling of the situation – and he must reevaluate the limits of his own ambition. It’s impossible to know, most of the time, what goes on behind Don’s curtained exterior, but to me, Don’s insistence on seeing Lane’s body, cutting him down, and treating him with as much dignity as possible stems from Don’s sudden realization that he and Lane had more in common than he imagined. And with that in mind, I wouldn’t be at all surprised to see Don calm his ambition next week, abandoning Baxter and attempting to do right by the qualities his life does possess, rather than those it doesn’t. Because if he’s always chasing a new desire, his fate won’t be any different than that of Lane Pryce. Sally, too, has reached a rather profound crossroads. For much of “Commissions and Fees,” her story mirrored this season’s “At the Codfish Ball.” Both involved Sally coming to stay with her father, and both saw her toying with adulthood. Here, she’s moved even farther towards imitating the grown-ups around her, sniping at her loved ones with the world’s best Betty impression and talking relationships with Megan at lunch. It’s no surprise Sally feels she must run towards maturity; with Betty so clearly fed up with being a mother and Don too busy to notice her, Sally must be her own adult influence. 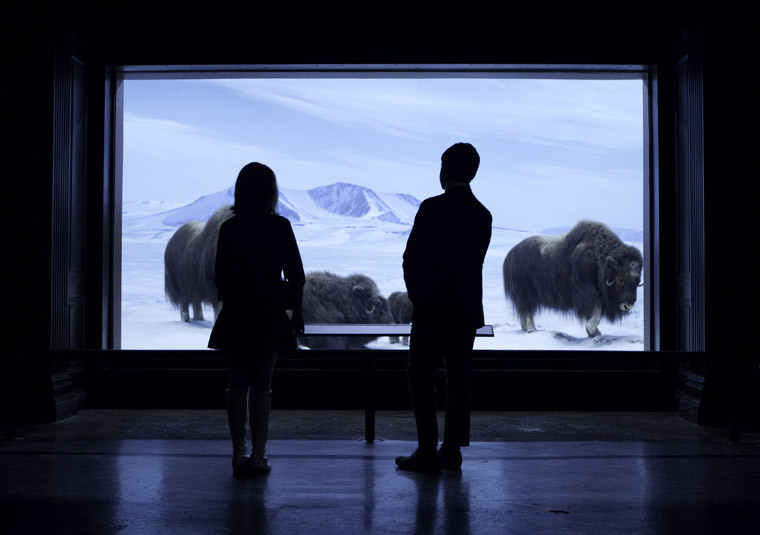 But once Sally and Glen arrive at the museum, the story takes an unexpected, poignant left turn. Sally may have called Glen over out of a desire to demonstrate her maturity, but once they’re finally together, they begin talking like children. They loosen up, cease putting on airs, and talk about what they’re feeling in simple, uncomplicated ways. Sally confesses she wishes Betty would get a divorce, Glen admits he’s bullied at school, and neither judges the other for the shame they acknowledge. They make it clear, right from the beginning, that neither is romantically interested in the other, and that even though they may talk big about being ‘adult’ around others, when they’re together, all they need or want is to be friends. It’s a truly healthy, cathartic exchange, one that gives both characters a chance to be themselves, rather than the young adults they often feel they need to be. So of course, just as Sally has relaxed into being a healthy, friendly kid again, she has her first period. Irony, thy name is Mad Men. It’s another contrivance that could feel heavy-handed, but instead, it leads to what may be my favorite exchange between Sally and Betty in the show’s history. 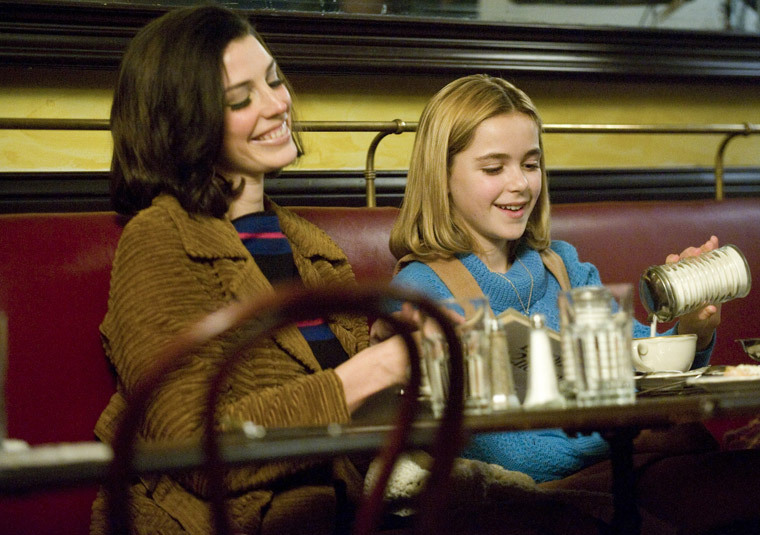 Becoming ‘a woman,’ as Betty puts it, doesn’t make Sally feel mature; instead, it makes her revert to a supremely childlike state. She’s seen what adult life entails for the grown-ups around her, so even if she likes to pretend, the reality of taking a big step closer to maturity terrifies her. In that moment, she needs to be comforted, even if it comes from the mother who’s so often neglected her. And Betty, for the first time in ages, feels truly needed, and recognizes it as a good, warm feeling worth latching on to. The sight of those two huddled in bed, Betty saying all the right things for the first time in ages, was positively heartwarming. As worthless as Betty seems on occasion, she has been through an awful lot of turmoil in her life, and she knows how to be there for Sally because she knows what Sally’s scared of. She knows that adulthood is tough, and tumultuous, and dangerous even for the best of us. Sally, after all, has just as much a chance as Lane of winding up with a noose around her neck, for there is no telling where her life will take her and how she’ll perceive and respond to the world around her. But for now, she still has her mother, and her mother still has time to comfort and shield her from the darkness of this world. 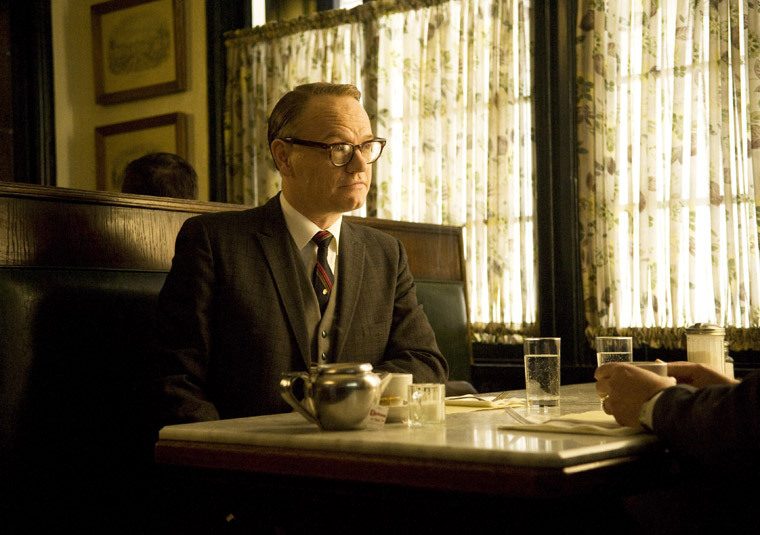 That Mad Men can deliver a moment as beautifully uplifting as that and as torturously depressing as Lane’s suicide in a single episode is no small feat. But for this wonderful fifth season, it’s practically par for the course; “Commissions and Fees” is merely the latest in a string of truly remarkable episodes. 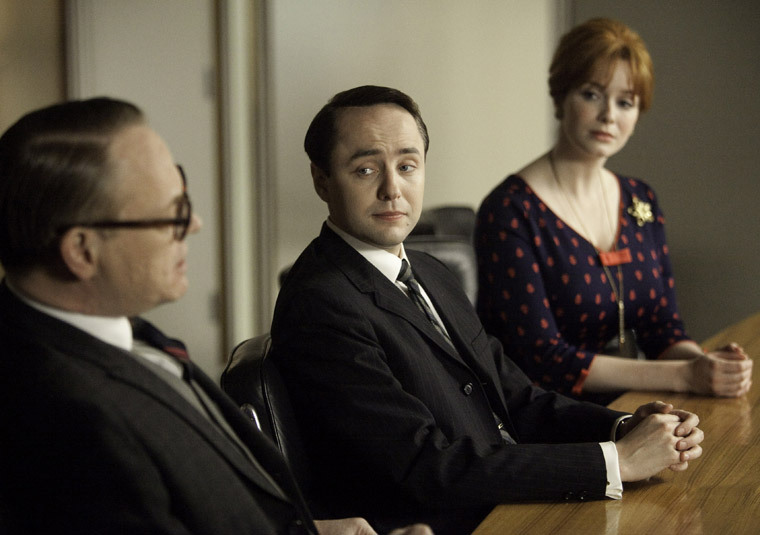 That being said, Mad Men faces a crucial test next week. Lane is the first main character to die in the series’ history, and “Commissions and Fees” did a tremendous job illustrating the weight of that death. I suspected Lane was going to commit suicide from early in the episode, so the ultimate revelation felt so much more powerful when it was Joan, Pete, and the others who had to be surprised by it, rather than us. The way that scene was directed, with us only seeing reaction shots instead of the body itself, put my stomach in knots, and Don’s reaction upon returning to the office only increased my nauseous physical reaction. Tonight's episode couldn’t possibly have done a better job making us feel the impact of Lane’s suicide, but as I said, the show’s real test will be extending that impact to the finale and beyond. Lane’s death must mean something to these people for it to count; they must be affected in dramatic, organic ways, or Mad Men will have sacrificed one of its best performers and most fascinating characters for nothing. I have faith the finale will hit home appropriately. An episode like “Commissions and Fees” gives me that faith. But the show has set a very large challenge for itself, not just in properly following up on Lane’s death, but in crafting a finale that matches the extraordinary quality and thematic depth of this landmark fifth season. But if you’re going to set a creative challenge, that’s a damn good one to have. Next Sunday can’t come fast enough. Jonathan, that is a great summary. You are a very very good writer. Thank you. This is a very wonderful review. I liked that you illustrated the inverse relationship between Don and Lane. I hadn’t noticed that when I watched the episode. While watching the episode, I couldn’t quite understand why Lane would take such an easy route. To me, it seemed like he was running away from his problems. Yes, it is extremely hard to start over but giving up is not an option. However, with this review, I can see why he thought the solution to his problem was killing self. 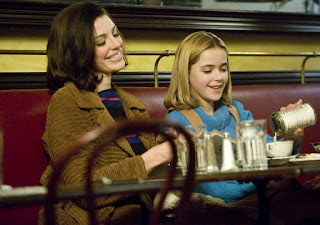 The writers of Mad Men definitely foreshadowed a bit when Don said, “Take the weekend. Think of an elegant exit.” And he did. I am glad you pointed out the irony of Sally becoming a kid again and then having to deal with maturing as a woman. I also didn’t think of that. I just thought of it as, when she actually comes to face with adulthood (after pretending to be an adult), Sally realizes that it is not all that she hoped it would be. Just as you said, her experience at the codfish ball and in this particular episode are almost parallels. Another parallel I noticed was the way Lane killed himself. By the way, it was very interesting that you pointed out how unreliable the Jaguar was, and how Lane’s suicide didn’t even prove to be an easy route to take. But what I found particularly interesting was the fact that Don’s half brother also committed suicide by hanging himself. In conclusion, it was a very great review. I just recently found your blog and would be definitely checking out your thought on other TV shows and movies. It's remarkable that you were able to put together such a well-written and insightful article just a few hours after the episode aired. You are very good at what you do. I look forward to reading more of your articles. That was an awesome review Jonathan. I wish I could do what you just did with a simple episode of MM on any of my coursework. Very well written and prior to that: You have a gift of reading in between the lines of this episode so accurately. You are brilliant, Jonathan. I get so much more out of the episodes after reading your reviews. Thank you. Yes, great review! I've read about 10 of them re this episode & no question, yours was by far the best & most enjoyable to read. Well written review; however, you're letting Draper off the hook. His destructive tendencies used to be self-directed; now he's taking dead aim at others. First Peggy last week, now Lane. Lane makes a desperate yet persuasive case for himself: 13 day loan, the onerous English tax system, going the extra 3000 miles to put the Firm's affairs in order. Yet Don can show no mercy; he's just been scolded by Bert Cooper, been called a child among adults. Lane, down the food chain a notch,is easy prey... Considering his culture, heritage and professional competence, (his tax problem, remember, is due to liquidating assets to prop up the Firm)Lane feels he has no choice but to kill himself. The viewers know it too. The embarrassment otherwise would kill him eventually anyway. 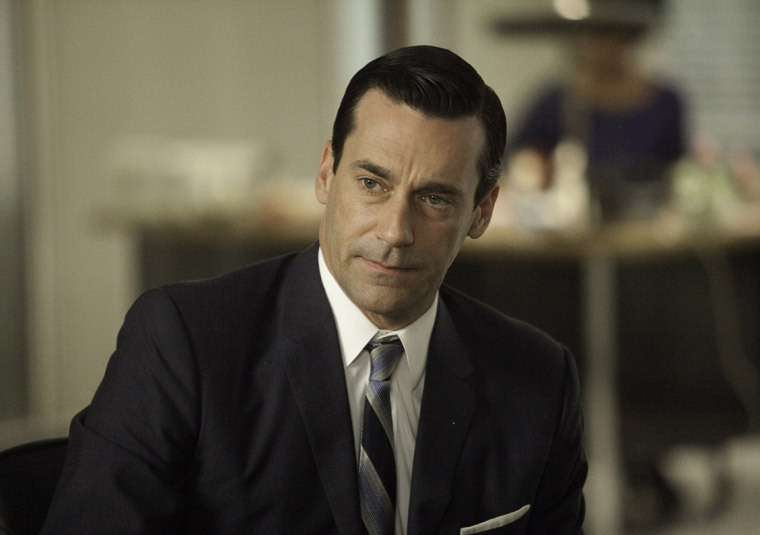 Sorry, Jonathan: in the moral universe of Mad Men, this one's on Don, and he's going to pay. The one thing that I felt was lost in this episode was the whole Peggy storyline. It seems simply illogical that we were never shown the reactions of the staff at SCDP to Peggy's departure. This episode was as if Peggy never existed at all, and I don't think that's fair to us as viewers. Peggy has departed. She is gone, and she won't be back. While the impact of her absence may be felt by those closest to her at SCDP, it's most likely that we won't see any expressions of this impact directly. This was a fantastic review, Jonathan! I got so much from it. You did an amazing job. Very insightful. I look forward to reading more of your work. I think you are misreading the meeting with DOW. The whole season has been about Don accepting status quo and being happy. He realizes in this episode that Lane, someone he cares for, was suffering with the "piddlying around." The scene with Roger right after Lane's emotional outing shows that Don has been selfish recently with his contentment with all things on cruise control at the agency. He feels guilt over not having to have pushed himself for more success to give everyone Christmas bonuses so Lane would not have gone through the crisis of being found out, a feeling Don is intimate with. The meeting with DOW is Don taking responsibility for his lack of leadership putting Lane in his situation. Watch how the scenes unfold. 1) Don confronting Lane and then realizing what Lane was going through because the Agency has not been doing well. 2) Don confronting Roger saying he is "not happy" that they could not pay out Christmans bonuses. 3) Meeting with DOW where we see Don was like DOW this whole season being 50% happy and how that is causing problems at the Agency. 4) Lane's suicide confirming "symbolically" that Lane's meltdown was enough guilt to trigger Don to want more than 50% it was not enough time for Don to emotionally, psychically process his guilt over his inactions this whole season. I am completely blown away by this intensely intelligent review... Thank you! Great review. I wonder if Don telling Lane to "plan an elegant exit" had anything to do with why Lane chose hanging in his office, other than the car not starting. Incredible episode all together. Traumatic but a cute scene at the end with Glen driving his first car.